2019 Reissue - Standard Black Vinyl Edition. Barbara Howard's On The Rise is more than just another rare soul LP. It's a love story. It's a dream. It was an attempt to break through. And although Barbara certainly never became a star, one song did become a staple in rare soul and funk DJ sets, keeping interest in Barbara Howard just under the surface. And as fate would have it in 2016, a sealed copy of the LP would find its way into Plaid Room Records in Loveland, OH and kick start the revival of her story and her music. In 1968, as an outgrowth of a community movement and talent search program called "Operation Step-Up", Steven Reece wanted to take his community movement to the next level. This is when the idea of founding an independent label came to mind. The idea was to self-produce quality records and through successful sales attempt to land major label distribution. Steve identified Barbara Howard as the talent and set to producing her record. The idea was to produce an LP with a variety of tracks that could be marketed to a variety of radio formats and markets (gospel, pop, soul, jazz, etc.). And while the record fizzled shortly after its release, Steve and Barbara ended up getting married shortly afterwards making this possibly the most romantic production of a record is soul music history. 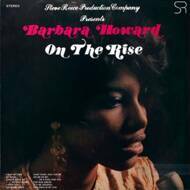 So via Colemine's reissue imprint Remined Records, we are proud to present to you Barbara Howard's On The Rise.